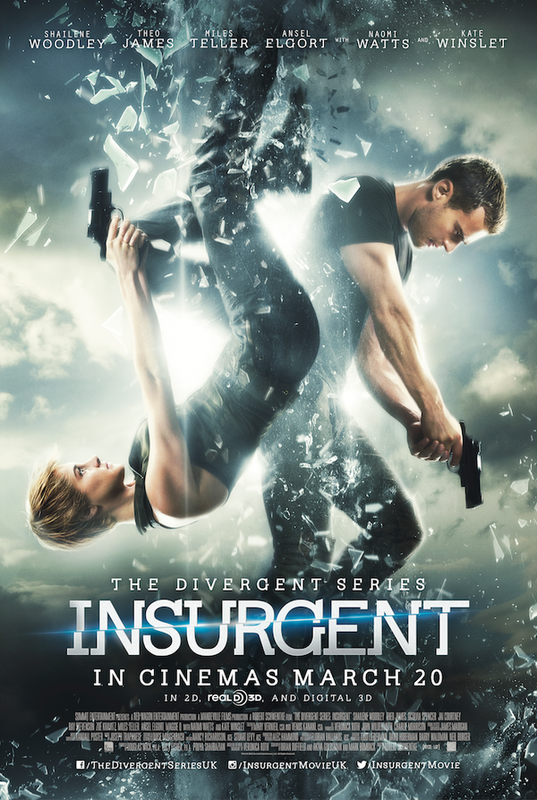 When I saw last year’s DIVERGENT, I enjoyed it more than I thought I would – despite a ridiculous premise and a Jansport-worth of teen melodrama, it still managed to leverage its strong cast and cook up some decent sci-fi action. THE DIVERGENT SERIES: INSURGENT, the second film in the trilogy, is bigger, slower, and dumber in almost every way. If you saw the first film, you already know that Earth’s last inhabited city is genetically divided into five single-function social factions – Abnegation (government), Candor (law), Dauntless (security), Amity (food) and Erudite (science) – plus a factionless proletariat and a new, irrationally feared amalgam of the above five, dubbed Divergent. Last we saw, Divergent Tris (Shailene Woodley) and her rag-tag group of apple cart-tippers – boyfriend Four (Theo James), brother Caleb (Ansel Elgort), and the aptly named Peter (Miles Teller) – were on the run after attempting to foil the megalomaniacal Erudite Jeanine’s (Kate Winslet) plot to mind-control Dauntless into slaughtering Abnegation. What you don’t know is that Jeanine’s whole reason for going all Bond villain was to get her hands on an ancient box that can only be opened by a Divergent, leading her to conclude that it probably contains a message telling folks to kill all the Divergents. (Wait… what?!) So, Jeanine’s trying to find a Divergent powerful enough to pop her box, while Tris and her fellow rogues attempt to elude capture long enough to amass an army of their own. And so breadcrumbs of predictable narrative are parceled out one scrap at a time as the film blunders through setpiece after setpiece , all of it in plain sight of the massive elephant in the DIVERGENT series’ paste-white, empty room: a malnourished, under-developed fictional world. … But DIVERGENT did a lot more to compensate for and bolster its (let’s face it: inevitable) dangling strands of narrative illogic. INSURGENT just looks crappy, especially compared to Neil Burger’s visually sumptuous (at times overwrought) DIVERGENT. The factions’ once-striking costume designs have lost much of their color and stylistic flair (Caleb looks like a bleedin’ chimbley sweep), while the new sets have a bland spaciousness that comes off more flimsy cheap than future chic. Apparently, this sequel had a higher budget, but most of it appears to have been used to pay for both excessive CGI (more runtime-padding, serum-induced simulations) and the parade of talented actors who peek in for glorified cameos. Octavia Spencer, Naomi Watts and Daniel Dae Kim all stop by as various faction leaders to put a recognizable face to some meaningless dialogue. While we’re talking actors (i.e., the best thing INSURGENT has going for it), Shailene Woodley is as game as ever, bringing everything she can to a Katniss-lite character whose only two moods are determined (because, dammit, she’s Divergent!) and emotional breakdown (because *sob sob* she’s *sniffle* Divergent!). Both Teller and Elgort ham it up in opposite directions - Teller playing Peter as a somehow even cockier version of his character from THE SPECTACULAR NOW and Elgort making the most of Caleb’s slimy, spineless nebbish – resulting in a few of the film’s more entertaining moments. All of it is ultimately wasted as the cast is chased from Amity to factionless to Candor and back. A brief melee aboard a hurtling freight train provides the movie’s most compelling action sequence before everything devolves back into endless running and gunfire. It all finally wraps up in a laughable, arbitrary revelation of Poochie’s-an-alien proportions.